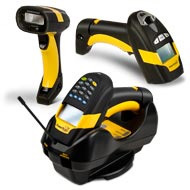 The PowerScan™ PM8300 cordless laser scanners are Datalogic Scanning's premium line of rugged industrial handheld data collection products for linear codes. The PowerScan™ PM8300 cordless laser scanners are Datalogic Scanning's premium line of rugged industrial handheld data collection products for linear codes. The PowerScan PM8300 series includes different models able to satisfy all customers' needs; the PM8300 is the basic cordless model; the PM8300-D intermediate model includes a display and 3-key keypad; and the ultimate PM8300-DK model features a display and a full 16-key keyboard. The PM8300-DK model significantly increases the sophistication of interaction with the host system and opens up new potential uses of the scanner, making it suitable for applications that would normally require a more expensive portable data terminal. The mobile phone-like keyboard allows for the manual entering of bar codes that are not readable and enables easy management of simple code-quantity applications like inventory, picking, receiving, etc. Narrow band radio communications with Datalogic's STAR Cordless System™ provides the key to increased productivity and flexibility in the workplace. It offers scalable solutions from simple point-to-point applications to networking capabilities combined with seamless roaming for complex installations. The PM8300 readers feature Datalogic's exclusive 3 Green Lights (3GL™) for superior good read feedback. The patented ‘Green Spot' directly on the code and dual Good Read LEDs on the top and back of the cap adds increased visibility at any angle. Superior reading performance is enhanced by Datalogic's patented PuzzleSolver™ technology for fast and accurate reading of standard, poorly printed and damaged codes.